EU Council President Donald Tusk and Ilham Aliyev, February 2017. EU official photo/CC BY. (Brussels, November 23, 2017) – Leaders of European Union member states should press visiting Azerbaijan President Ilham Aliyev to end the crackdown on critics and commit to concrete and sustainable human rights reforms, 37 non-governmental groups said in a letter to heads of European Union member states. On November 24, 2017, the heads of the 28 EU member states’ governments and of the six Eastern Partnership countries– Armenia, Azerbaijan, Belarus, Georgia, Moldova, Ukraine– will gather in Brussels for the 5th Eastern Partnership Summit. Among the 20 Deliverables– or goals– for the Eastern Partnership by 2020, the European Union has, notably, identified a vibrant civil society as a prerequisite for “democratic, stable, prosperous and resilient communities and nations.” In recent years however, Azerbaijan’s government has flouted these commitments by adopting and enforcing laws and regulations that severely restrict independent voices. The government has shut down independent media, and blocked the websites of media outlets that are now forced to operate from abroad. The government also has intimidated, harassed, and imprisoned independent journalists, human rights defenders, pro-democracy activists and other members of civil society. While over a dozen unjustly imprisoned human rights defenders and government critics have been released since the end of 2015, their convictions stand, and some of them face travel restrictions and are unable to work without undue government interference. Dozens of other activists remain behind bars, and the authorities continue to use politically motivated charges to jail government critics. Among them, Ilgar Mammadov, leader of the political opposition REAL party, has been in prison on trumped-up charges since 2013. The Azerbaijani government has refused to comply with a May 2014 judgment on his case by the European Court of Human Rights (ECHR), which concluded that the government detained him without evidence to silence and punish him for criticizing the authorities. The Council of Europe’s Committee of Ministers issued more than a dozen resolutions calling for Mammadov’s immediate release. After the government’s persistent failure to release him, on October 25, the Committee of Ministers decided to trigger unprecedented legal proceedings against Azerbaijan, which could ultimately result in a challenge to Azerbaijan’s membership in the Council of Europe. Azerbaijani authorities have also targeted journalists and the media. Mehman Huseynov, a well-known journalist and blogger, was sentenced to two years in prison on bogus defamation charges in May after reporting that several police officers arbitrarily detained and beat him. Another journalist, Afgan Mukhtarli, was kidnapped in May by unidentified people in neighboring Georgia and taken to Azerbaijan, where the authorities pressed bogus criminal charges against him. Non-governmental organizations in Azerbaijan face serious obstacles to operating due to laws and regulations that require both donors and grantees to separately obtain government approval for every grant under consideration. In January the government made it easier for groups to apply to register their funding, but the government has continued to use broad discretion to deny its approval. 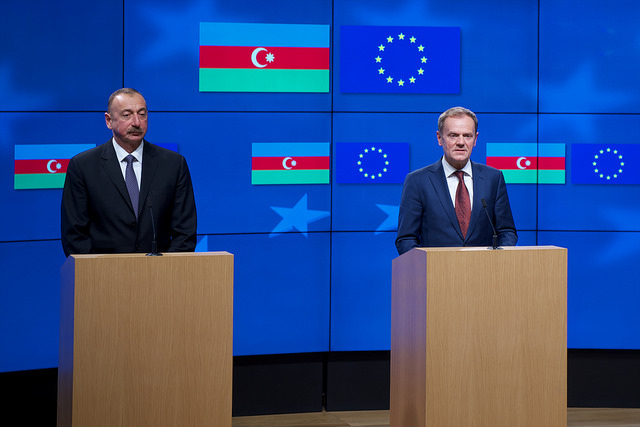 Since February 2017, the EU and Azerbaijan have been negotiating a new partnership agreement to enhance political and economic ties between them. The new agreement would replace the 1999 Partnership and Cooperation Agreement, which guided their bilateral relations in political dialogue, trade, investment, and economic, legislative, and cultural cooperation.